Had baby sis talked my Mom into writing down one of Jack LaLanne’s fitness routines, we’d probably all be buff to this day…instead, we all cook – but, hey, no one seems to care about much when they tuck into this incredible chicken dish flavored with wine, sausage and peppers, with a bit of rice to soak up the flavorful sauce. Living in a small Iowa town, Mom had to use pepperoni instead of the elusive csabai sausage Graham Kerr called for; a good pepperoni, not the presliced is best. A Spanish chorizo would work, too. I stream lined it (one pan only) to make it quick enough for a week night. Sometimes I add a little saffron – it gives a boost to the flavor. The cooked peppers and tomatoes, although just shown here as a component of the dish, are known as “piperade” or “piperrade” in Spanish. They can actually serve as a dish on their own, and you may recognize them as a “Spanish” sauce served with eggs or omelettes. The rice & sauce together taste like a really gourmet “Spanish rice” which makes sense when you consider that the Basque Region straddles ares of Northwestern Spain and South Central France. To shortcut this even more, if peppers are at a great price, I’ll cook up a large batch and divide up to freeze which makes this dish almost “instant” on any old week-night. Other times, I may simply substitute a Sofrito for the peppers. This dish taught me the art of “fortifying” flavor – saving aside and adding in a few of the important ingredients in a second addition toward the end of the cooking process to reinforce the flavor. The combination of the wine and tomatoes that have been cooked longer along with the bit more added in toward the end of the cooking gives you a really complex spectrum of flavor. Even better the next day, you may want to consider doubling the recipe. My mother liked to put the rice on a platter, make a well in the center and fill it with the peppers and chicken. Then she’d pour the chicken and sauce in the middle and sprinkle it with parsley. I did that for the photos – tres dramatic, but to tell you the truth I usually just serve this “stove-top” and everyone helps themselves! See “Put your Own Spin on It,” below, for some variations. In a large skillet, heat olive oil, add chicken breasts and brown on one side. Turn and add pepperoni. Cook until fat is rendered from the pepperoni, then add garlic and saute for just a moment. Next add peppers, 1/2 of the tomatoes and 1/2 cup of the wine. Cover and simmer for about 20 minutes or so, until chicken is just done. Remove the chicken to a platter and tent to keep warm. To the skillet, add in the rest of the tomatoes and wine and simmer for a few minutes to concentrate the sauce. Stir in parsley. 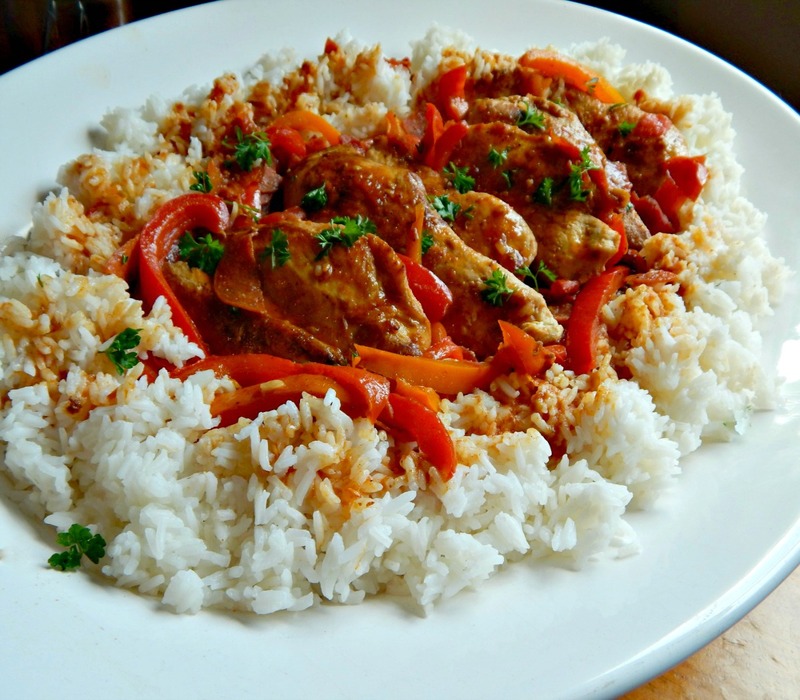 Serve the chicken over a bed of rice topped with the pepper mixture and pan juices. A marvelous presentation is to place the rice on a platter. make a well in the center and fill with the chicken, peppers and sauce. When cooking a meal, make your meal “Kit” for next time; your own convenience food. This could be taking a time-consuming component and doubling, tripling or more and bagging it up for making the same dish later. This works great with things that can be easily frozen, like the peppers for this dish, or with dishes like Chili, Spaghetti, Tacos, Fajitas, etc., that have a whole lot of spices that can be measured out in multiples, labeled and put aside for future meals. I often add a good pinch of saffron in the sauce right before I add the peppers. Graham Kerr used mushrooms in the dish, which are good – but we love the pepper flavor undiluted. Last time I made this dish, I didn’t have any fresh tomatoes, and not wanting to open a can for just a few (if I do open a can for something and don’t use it all, I’ll throw it in a Ziploc labeled with the approximate number of ounces I think are left and use at another time) I threw in about a cup of my leftover “Aji Salsa” and it was marvelous. I may very well try it with other salsas in the future. You could certainly cut back on the olive oil, although it becomes more than just a medium to cook with – it is actually a component of the sauce itself. Try using a vermouth instead of white wine for an equally delicious change. This entry was posted in Click here for Bargain Meals, Click here for Fabulous Food Posts and tagged Alcohol, Basque, Bell Peppers, Chicken, Easy Recipe, Family Recipe, French, Frugal Hausfrau, Galloping Gourmet, Graham Kerr, Heritage Recipe, Olive oil, Tomatoes, Wine. Bookmark the permalink. Great suggestions, and thanks for commenting! I don’t make it to Trader Joe’s as often as I’d like – and I have the best of both worlds, Trader Joes and Aldi (which I do go to often) right by each other! I was just thinking, back when I wrote this, we didn’t even have a TJ’s nearby! Now we have seven! Thanks for linking me over to this, I think. LOL! Now I feel dated. I totally forgot about the Galloping Gourmet. Ah the good old days….. I know, right! 🙂 Funny thing about the old days, everyone that was old enough knows almost every show there was, just because there were so few choices. There was a common culture shared that the kids of today don’t have. How true. It is sad to see kids grow up with the need for instant gratification. TV shows within a TV show, fast forwarding through commercials… I’m sure there is a positive side to it, but I wonder about the long term affect. I can picture the two of us reminiscing about the past and trying to decide if we should cry or be happy we have the memories that we do. I think that there is always a bond when people can look back and remember how good we had, or, thought we had it. What seemed like simpler times to us, probably come across as complicated to some. I live a happy life, and you have brought a ray of sunshine into it Frau, Thank you. You are always so gracious! Another lost art! Oh, I jogged in place when I let Gibson out this morning, while I waited for him, and them my neighbor popped out of her house! *Caught redhanded! * I just waved and kept going…. Thank you. I still believe in opening doors for my wife or a lady close by. So you were caught being healthy were you? LOL!